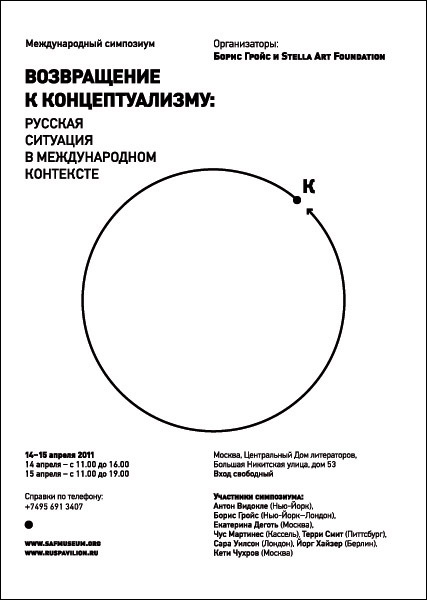 Главная › Main › News › 11 Апреля 2011 - Symposium "Revisiting Conceptual Art"
Boris Groys and Stella Art Foundation organized an international symposium "Revisiting Conceptual Art: the Russian Case in an International Context", which was held on April 14 and 15, 2011 at the Central House of Writers at the Central House of Writers in advance of the 54th Venice Biennale. The interest in the Conceptual Art of 1960s–1970s is characteristic of the today’s international art scene in general. The same can be said also about the contemporary Russian art scene. But this new interest in Conceptual art raises a number of questions concerning the legacy of Conceptual Art and its historical past. One of the main questions is the following: Are there only one or many Conceptualist traditions? Or, in other words: Is Conceptualist Art a unified artistic phenomenon or we are able to speak about different, even heterogeneous Conceptualisms? These and many other related questions will be discussed at the Moscow symposium.